"A MAN WITH A CONVICTION is a hard man to change. Tell him you disagree and he turns away. Show him facts or figures and he questions your sources. Appeal to logic and he fails to see your point." Education reforms deal with problems that involve a complex multitude of variables. Education also touches each one of us in a very personal way. Education can be used by society to shape itself. Education can be liberating, but can also be colonizing depending on the people on the steering wheel. Thus, both multivariate and social natures of education naturally lead to an extremely challenging situation for the methods of science. To compound the situation further, certain variables that affect education can compete against each other in the face of limited resources. Take, for example, the salary of teachers. Studies in the United States show that increasing the salary of teachers attracts and retains talent, is associated with better qualified teachers, and is strongly correlated with lower dropout rates of students (http://schoolfinance101.wordpress.com/2010/10/27/when-schools-have-money/). With limited resources unable to cope with higher salaries for teachers, the pupil to teacher ratio must go up. The ratio and the salary now become two competing variables. A choice needs to be made. In such a case, how does one measure? How does one compare? Which one is better? (1) A class of eighty students taught by one good teacher or (2) Two classes of forty students, each taught by a teacher who is paid half as much as the one in the first case. Of course, these cases can become even more complicated if one begins to question whether a large class size may also affect recruitment of talent into the teaching force. Large class sizes could very well be formidable. And this may in fact turn away good teachers, who have the mastery of the subject and the skills to reach out to students, but feel threatened by the challenge of keeping eighty students in line. In studying such cases, one can see that extra care is definitely required. Unfortunately, the human mind does not seem to work in this manner most of the time. We usually fall into making split-second decisions on top of the fact that we are guided by prejudices. Doing the study for example to learn more about teacher salaries, pupil to teacher ratio, and how these two affect the quality of education, will be painted right at the very beginning by our own preconceived notions, beliefs and experiences. In other words, we will seek the methods of science not to search but to rationalize. We will be acting like politicians, finding data to rally their cause. For a true evidence based education reform to exist, it then becomes necessary to describe first the situation in its entirety. In the way our human brains have been wired, we will always seek evidence that supports our inclinations, so we must begin with stating what the goals really are. Only with clearly defined goals would it be possible to design studies from which we would base our decisions. With this purpose, saying "quality education" is the goal may not even pass as a "clearly defined goal" because "quality education" may mean different things to different people. It could mean "employability at the end of schooling", "inculcating values necessary for the society to thrive", "acquisition of basic skills so that individuals can function in a society", or all of the above. Hence, we must deeply examine what the problems really are and what we really hope to achieve. Objectivity, one that is required by science, begins with a clear statement of the problem. And in a complex case of basic education, ironically, objectivity could only be attained by a complete contextualization of the situation we are facing, of the data we currently have, and of the challenges we currently must surmount. The first step requires collection of all data that describe the problems that we intend to solve. And the collection does not stop at putting these numbers in neat tables or nice graphs. We must fully recognize that these are the problems. True recognition is only achieved if, at the end, the solutions we suggest will in fact address the problems we described at the beginning of the study. There maybe multiple problems and the problems may not be independent of each other. Nonetheless, the first step requires recognition of these problems and a deep understanding of what each one entails. The second step is acknowledging our bias. It is there, whether we like to admit it or not. I have mine and I sure can find data and facts out there that would support my biases. Critical thinking starts with an acknowledgement of these inclinations and seeing how these relate to the facts that have been gathered. These prejudices influence one's analysis and discussion of results. For this reason, scientists submit to peer review and skepticism. And we must. We must consult others (Consultative is not equivalent to describing or explaining to people what one means - it requires, more importantly, listening to what other people have to say). Basic education is huge. It involves so many factors. And thus, it only guarantees that most reforms will fail. But if we are aware of our goals, we may be able to isolate and separate some of these into independent or mildly correlated components. Its complexity is showing us that conservative principles maybe quite useful, that is, to attack the problems one piece at a time, surgical and not general. The consultative period coincides with the implementation period, which clearly means that the public really had no say regarding K to 12. 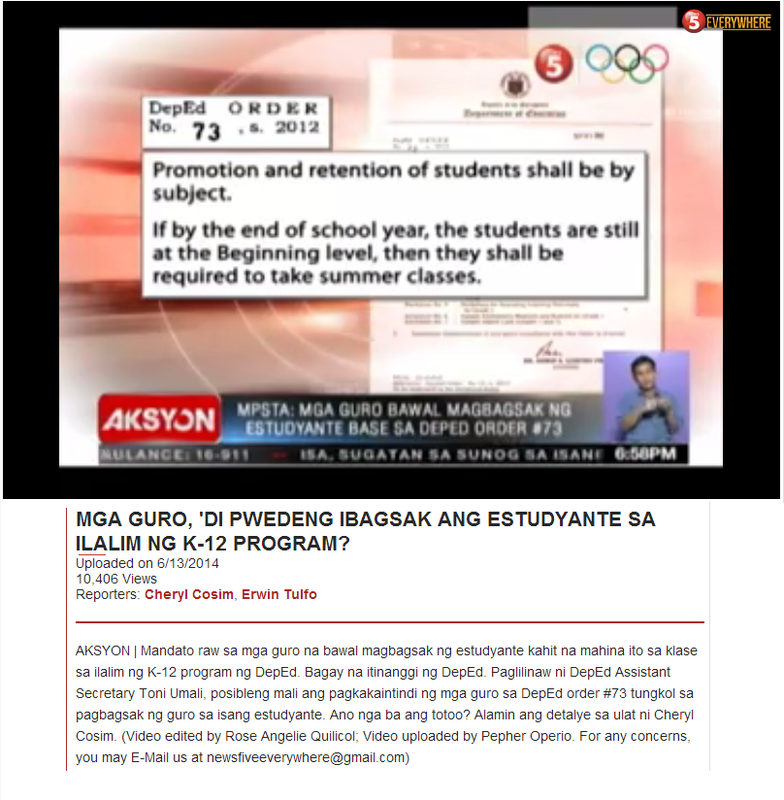 If these teachers are not informed, how could these teachers even begin to comment about the new curriculum. 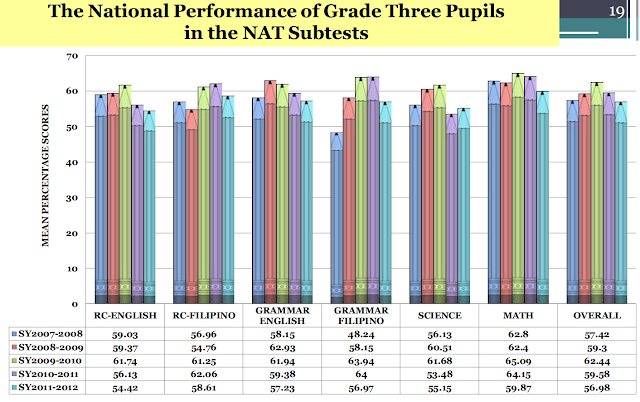 DepEd's K to 12 is also not conservative, as it tries to implement so many changes at the same time. And it is true, DepEd's K to 12 is an entity with conviction.... And so am I.